Leishmania is a protozoan infectious agent transmitted by the bite of a mosquito (Phlebotomus). This mosquito inoculates infectious agent and within its host (dog) leishmania replicates and causes disease. This disease can have many faces depending on the immune status (ie defenses) of our animal can cause problems in skin, eye, gastrointestinal, apathy, loss of appetite, lameness, weight loss and even affect vital organs such as the kidney or liver. It is important to remember that not all dogs with Leishmania they look bad or evidence the disease can be found in apparently healthy animals!! How can I suspect that my dog ? ?is suffering Leishmania? Animals with this disease may have one or more signs. In case I have the suspicion, what can I do? If you suspect your pet may have Leishmania take an appointment, we will explore the animal and recommend you if it’s necessary make diagnostic tests. Remember! 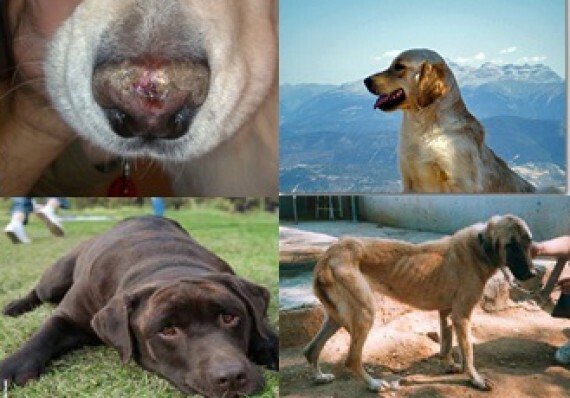 Not all signs discussed above are presented in all cases of Leishmania and not all of these signs can only occur with this disease. -in case the result is positive, we would send complementary tests to a reference laboratory and make a complete laboratory blood work and also urine for disease staging and choose the most appropriate treatment. -in case the result is negative we would not treat him as a sick patient but if suspicion still remains should perform other tests or repeat the test later. If my pet has Leishmania will be cured? Leishmania is replicated within the cells of its host (dog) and lifetime of the animal is kept. The goal of treatment is to reduce the amount of parasite so that patients are stable (no signs) and with a good quality of life. Many cases are treated once and not fall again because their immune system keeps the parasite controlled. Others respond well to treatment but throughout life may have several episodes that should be treated. In some cases where the disease occurs severely, with severe affected organs such as the kidney, treatment response can be more complicated and thus its evolution.